Pam’s Pictorama Post: A few weeks ago, right before my foot surgery, I was in East Hampton as described in my post Operculum about some seashell collecting that went on out there. Before heading back to Manhattan we stopped at a sale, held some sort of a town hall building. It was generally pretty upscale (no surprise there) and consisted largely of antique furniture, silver and some high-end vintage jewelry. (I just barely contained myself on that score – it is another weakness.) However, low and behold, for no particular reason someone was selling a whole jar of these. There were numerous giant insects one could choose from, but somehow this big, gorgeously colored beetle struck me as a perfect gift for Kim. It is encased in a plastic material and if you look carefully you can see a little stand that came with it. Cookie was very interested in making it her own – she is a cat that enjoys balls and will bat them around by herself, making up cat games. However, we have decided that this one is ours and we’d like to keep it pristine. For no discernible reason that I can explain, I have been buying Kim variations on this for years. I guess it is my own fascination – things encased in plastic and interesting bouncing balls – but he seems to admire them as well. Generally, I find ones that are really meant for bouncing – there were a number of different ones that light up when you bounce them – we all enjoyed those and I buy them whenever I see them. In turn, Kim purchased a ring that lights up for me which I enjoyed tremendously. 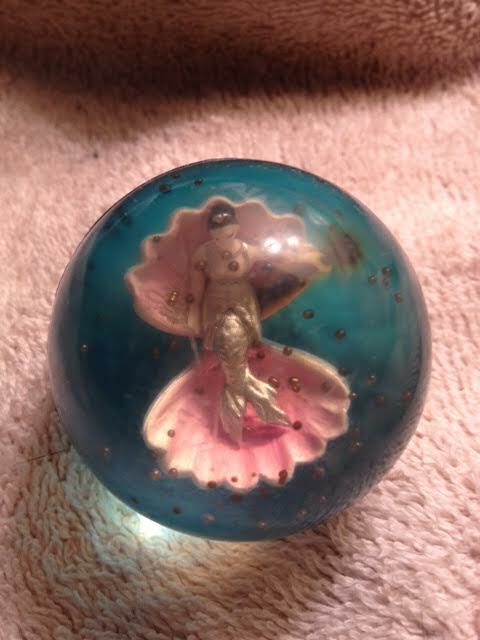 Another, an anniversary gift that we have attempted to keep from Cookie, is the mermaid below. To be honest, she is stealing it from me even as I write this as I have it off a shelve to photograph it to show you. Bad kitty! Kim is a lucky man! Kim’s the best! I’m a very lucky woman!